For over 12 years Thames Rockets have specialised in the solution to the best team and family activities in London. From the interns to the CEO, grandkids to granny's we can guarantee complete satisfaction from the minute you don your super warm waterproofs (if you need them!) to the minute you wave goodbye. Your satisfaction is our priority, and we deliver top quality group experiences each and every time. We will look after you every step of the way, with our knowledgable bookings team guiding you through the planning process from conversation to confirmation! However, we’re not the heroes here. We’ll leave that accolade for you when your crew thank you for arranging the best treat in history! With a bespoke soundtrack celebrating Bond through the years you're guaranteed to leave feeling like an undercover agent. Perfect for visiting colleagues flying through, to London city workers, to truly unique family adventures – Thames Rockets really do provide a licence to thrill! Five school friends celebrating being 50 years young decided to end their year of celebration with a blast up the Thames. 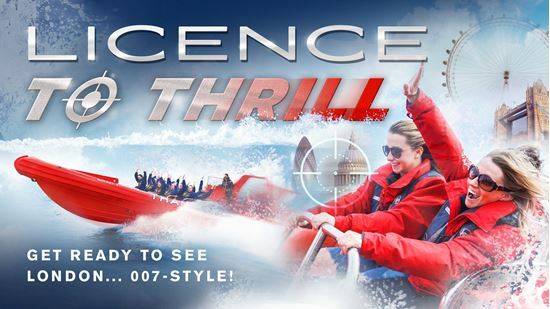 Traveling at high speed up the Thames with the James Bond theme playing... what’s not to like. Sightseeing with lots of interesting facts that as a Londoner I didn’t know! Must do! We first felt like tourists even though we are from Bromley! Guide had a personalised chat with everyone and we felt like honoured guests - then the speedy bit with a great soundtrack - James Bond theme tune and a whole medley of adrenaline pumping music added to the thrill of the ride - we loved it! Perfect for a James Bond experience with tunes that set you in the mood. Lovely see-sighting of iconic buildings in London and great pub reviews from Dave, our tour guide. Big up to Nick for driving us super fast! Heartily recommend.